On Yours Truly, Johnny Dollar, insurance investigation is a lot more than just documenting car accidents and property damage. 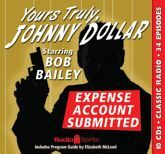 Bob Bailey stars as Dollar in 34 digitally restored and remastered episodes. Working freelance, he's called in on only the most suspicious claims, the most dangerous deals, and the most profitable policies. On the road to adventure and intrigue, he narrates each week's tale through the tally of his expense account. Strong characters, chemistry, and charisma are threaded through cases of arson, murder, and more.